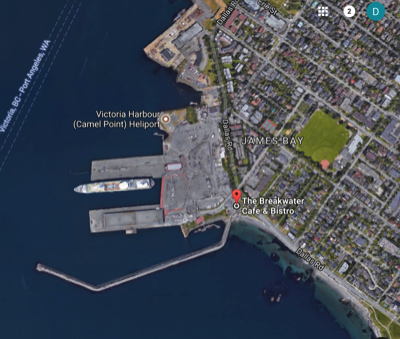 is a deep water port facility located in the southwestern corner of the city of Victoria, British Columbia, Canada. Its location in the historic and beautiful city on the southern tip of Vancouver Island, by the Strait of Juan de Fuca not far from Vancouver and Seattle, US, has made it an attractive cruise ship destination. It also serves as a ship repair and supply facility for cruise ships and other vessels such as deep sea cable laying ships. Ogden Point also has a heliport with frequent service to Vancouver Harbour, Vancouver International Airport, and Seattle. The port lies at the eastern entrance of Victoria Harbour. For smaller boats there is boat ramp for trailerable boats. Ogden Point was named after Peter Skene Ogden (1790–1854), who was a prominent trader and explorer for the Hudson's Bay Company. The piers at Ogden Point were built in the early 20th century by the city of Victoria in anticipation of a growth in shipping due the opening of the Panama Canal.